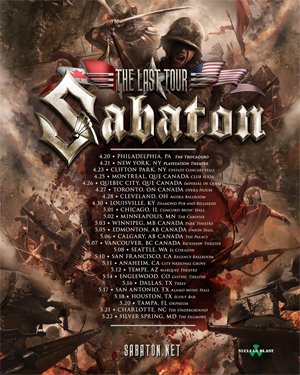 Swedish metal heroes SABATON will kick off their North American “The Last Tour” headlining trek in just under one month! The band is touring in support of their eighth album, The Last Stand. SABATON will be joined by symphonic metal group LEAVES' EYES and heavy power metal onslaught/labelmates BATTLE BEAST. Today, the band posted a new tour teaser video – if you’ve never witnessed SABATON live, make sure to take a sneak peek at the grandiose, epic onslaught that is the SABATON live experience! Watch it below.